Blinder, a fresh new company in creative and flexible golf bunker lining solutions, celebrated their 1st birthday earlier this year. The company's directors wanted to make sure the event was unforgettable and were in need of a fun & eye-catching invitation that provided a unique feel to match the company’s ideas. Their team came up with the idea of having a ‘Golden Ticket’ invitation. 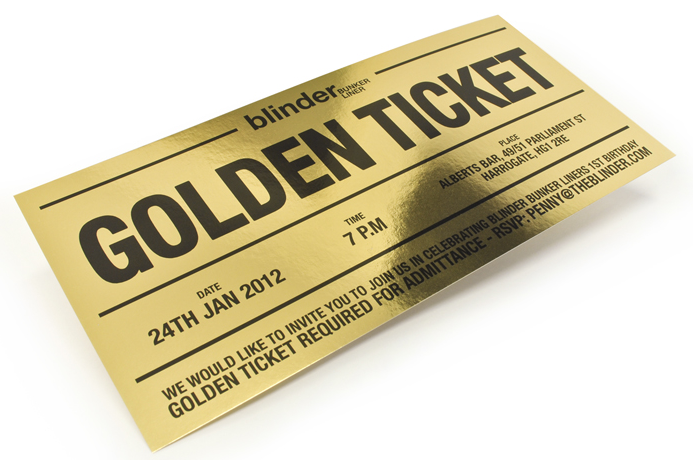 Using Mirricard Gold, the result was a unique glossy golden ticket invitation which was packaged with a bar of the company’s unique bunker lining product and a lead card.